Brooklyn, NY - Some Brooklyn homeowners in Sunset Park are demanding that a neighboring Yeshiva take action against a group of rowdy students. Living next to a school is rarely a quiet affair, especially when class is in session. But Jorge Toro says there’s no excuse for this kind of behavior. He says students are scaling the fence to get into his back yard. We spoke with a Rabbi Simon who did not deny his students have been causing trouble. But he says the school isn’t ignoring the problem and has installed security cameras to try to catch the troublemakers. Rabbi Simon says the students responsible for the vandalism could face expulsion. I personally thing that at least part of the stories are made up. Because if it would me true he would call the cops not cbstv. this is a big lie from that stupid neighbor that is walking up and down the street all day long and searching for problems. there is no rock throwing every day just a part of a wall collapsed so 1 out of 200 students threw a rock on a metal fence. the noise is only from 9am to 9:30 breakfast 1:45-2:40 lunch 6:15-6:30 all day long is as quiet as a cemetery ! his window was broken 4 times in the last 10 years, after he is refusing to let the yeshiva pay and put up a window bar ! the window is street level in middle of the school yard ! Throwing rocks, scaling neighbers fences, rowdy behavior and the best the Rabbi has to say is,"boys being boys"? How about a class in Derech Eretz. Here is a novel idea ..... instead of growing a population of rowdy boys due to lack of supervision and lessons in behavior only to expel them from school after school, why don't we actually teach them manners and proper behavior and to treat neighbors and property with respect. Was the rabbi interview during shacharis mynian, or does he wear tefilin all day? I lived behind a very reputable yeshiva and during recess it was horrible. What do you expect? Boys cooped up all morning and all afternoon will do that. But I had a newborn and needed my sleep, and was not sympathetic at all. Depends on your stage of life and how close the noise is. Levine says [to Number 4]: "I don't understand your comment." Aron Rottenberg in New Square does. Maybe he can explain it to you. “ Levine says [to Number 4]: "I don't understand your comment." What does this story have to do with aron rottenberg? Whats the name of the yeshiva? If "boys are boys" why can't there just be an adult to supervise those boys and making sure they stay out of trouble. This is a yeshiva that goes out of their way to make sure they have a good name. But I guess if it's not amongst yidden they couldn't care less. Don't know if you ever tried calling the cops for such "minor" issues, but I did and it took them 2 hours to show up, and by then everything was over. These boys have to learn to respect other peoples property whether they are Jewish or not. I do not think they have learned they have been taught that there is another world beyond the yeshiva. It is about time somebody woke them up!! I listened to the entire interview and this Rabbi said that the Principal had an assembly with all the students about this matter. The Rabbi sounded genuine in his responses to the reporter and made me believe the school is trying to do something, especially about the rock throwing and fence climbing. As far as rowdiness, go near any school in the city, private or public, and you'll see kids running around making noise. One comment struck me as funny: someone complaining that it was too loud to sleep during the day. I wonder if he also complains about the jackhammers of construction crews, the garbage trucks on pickup day, the gardeners' lawnmowers, and the cars honking on the streets. Many rabbonim and chashuve askanim working in yeshivot wear teffilin all day. Its not so unusual. I don't know what's so major with this news. Because a retired man who sits home all day decided to call a news reporter because they make noise its more than normal it should be noise during the day by a school, you cannot tell for boys to sit 12 hours locked in a building, its more than normal they should air out a little bit, its not like the public school that they go home 2 o'clock. I happen to know this school very well and its one of the top chasidic school in brooklyn because one boy threw a stone? If you really look into it, you will see this mostly gurnisht mit gurnisht. Its about an old fuddy duddy who has nothing better to do with his life than to complain about everything. Lets say they climbed a fence? I did that a million times to get a ball from the neighbor's yard! No one called the TV station about me! My son claims that the neighbor a retired sanitaion cop, sits home all day on a full pension and looks for things to complain about. The school has done everything in their power to decelerate the tension, including offering to pay for any damages and inconveniences. They attempt to keep a friendly dialogue open and are rebuffed. "Retired NYC policeman displays his gun in a threatening manner during an arguement with some teenagers who retrieved a ball from his property." Maybe they throw rocks because the yeshiva doesn't allow them to throw balls. The problem may not be that they are restless from class but they are restless at recess because the yeshiva doesn't give them anything to do at recess. They should be having ball games, rollerblading or doing other exercises. (No. 11) Levine says: "What does this story have to do with aron rottenberg?" Aron Rottenberg has become iconic as a victim of an ill-behaved Jewish boy named Shaul Spitzer. Spitzer (who is close to one of the world's most erudite rabbis) attempted and nearly succeeded in killing another Jew with whom he disagreed. As it was, Rottenberg was very severely injured by Spitzer. Would anyone take seriously an excuse that Spitzer was just a boy being a boy? Absolutely not!!! So grievious was Spitzers crime that he deserves some sort of penalty. It is clear that the Skvirer establishment is now mobilizing its forces to try to minimize if not avoid the punishment to which Spitzer will be subjected. Spitzer stands in stark contrast to the rowdy boys at the yeshiva, who, if they continue to disturb and harass the neighbors, will be expelled from the yeshiva. If throwing a rock against a fence on the playground is such a grave offense, how about setting a fellow Jew on fire?? So what does that mean, because they're cooped up all day they shouldn't have derech eretz towards the neighbors? That's what they learn - that it's ok to go out and throw rocks and destroy property? It's a chillul Hashem, plain and simple. 1. I don't even know where to start with your response. Did you know that there are honest hard working people who work a night shift? That means they sleep during the day! I'm not saying any neighbors there do, but you seem "shocked" at the fact that some people want to sleep past 7:30 AM. What if it were a retired zaidy? Should he be allowed to nap during the day? 2. All it takes is 1 rock to do damage & picking up a rock & throwing it is a sign of a Rasha to begin with. 3. 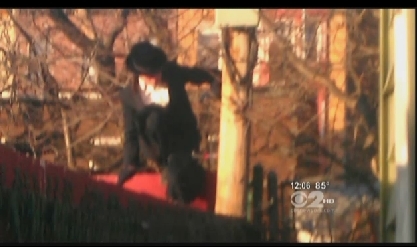 Jumping over the fence is just a plain lack of Derech Eretz. you're obnoxious , at least this man worked his whole life and then retired, most of those bochorim will probably end up mooching off the Government for many years to come and then retire without having worked a day in their lives.. Since everything else that is physical has been banned, I guess rock throwing is the sport of choice at the Yeshiva. Sad. So being rich doesn't stop you from being a bigot. Perhaps you should look in a mirror before yelling anti anything pure and simple. Don't be a tzadik on someone elses chesbon. Dont pretend to know the whole story. same type of behavior, and an attitude that i can do what i want without having any responsibility or care for other peoples property this a Hispanic neighbor hood i am sure they are walking ambassadors to the rest of the world. by the way this yeshiva lets the kids play ball !! Antisemitism? You're being sarcastic, right? rock throwing at someone isn't "boys being boys". It's assault with a deadly weapon, and is a felony.